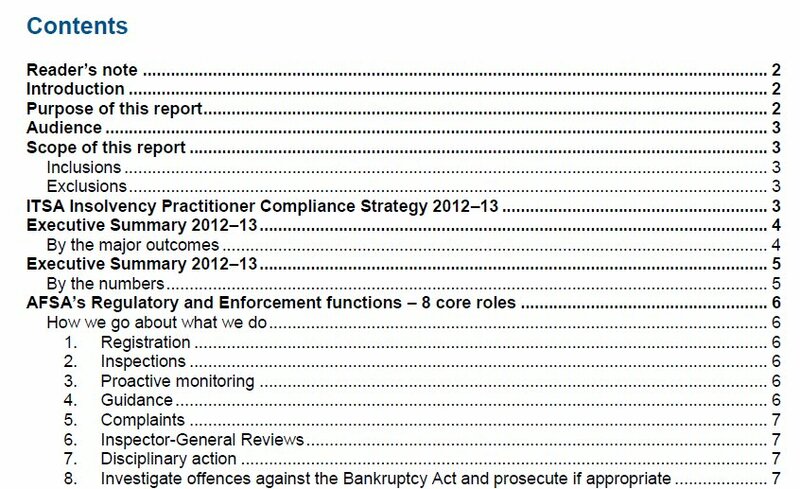 “Personal insolvency practitioners compliance report 2012-13”. The phrase “personal insolvency practitioners” refers to Registered Trustees in Bankruptcy and Registered Debt Agreement Administrators. A list of the CONTENTS is published below. For a copy of the report (PDF) CLICK HERE. I have created a directory facility for insolvency practitioners, lawyers and other consultants that provide specialist insolvency and recovery services (corporate and personal) to list their names and contact details. This facility is available free of charge and obligation free until 30 June 2014. 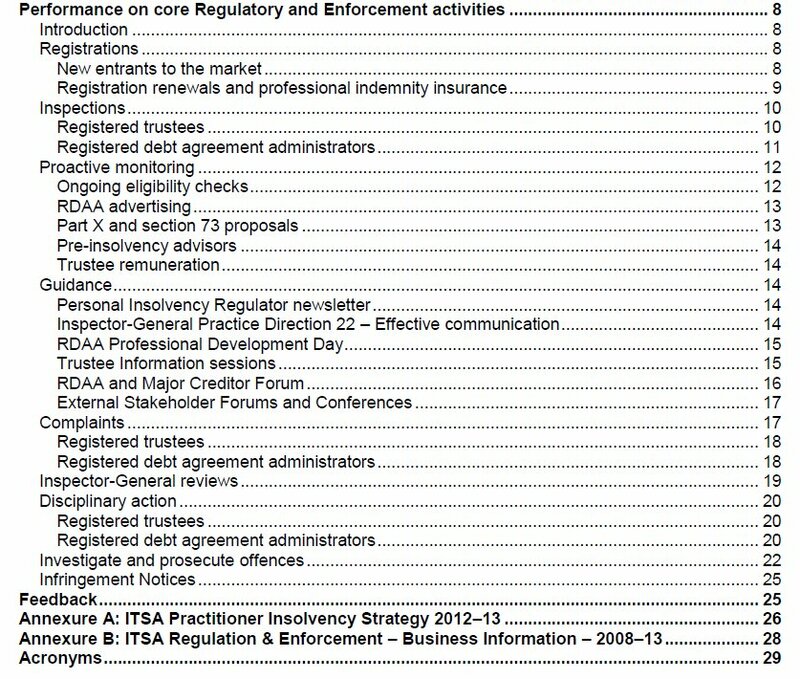 Just click on the menu item “Insolvency & Recovery Services Directory” (above). Then on “Submit a Listing”, and follow the prompts. You will be asked to enter your category of service, business name, location, phone number, and a description of your services. You can also supply certain other information if you like, such as your web site address. Visitors will be able search the directory by business name, category of service, location, etc. “The directors of two unrelated companies have been banned from acting as company directors for failing to maintain adequate accounting records. The disqualifications, which followed investigations by The (UK) Insolvency Service, were handed to Bradley Carter of Dr Spafish Limited, and Alan Coffey of Datadesk Computer Services Limited. Carter, whose company offered fish pedicures and also sold franchises, was banned for seven years. Spafish began trading in August 2010 and went into liquidation on 28 November 2011, owing £788,968 to creditors. The investigation found that due to the lack of available accounting records, it was unable to determine the company’s turnover, who benefitted from cheques and cash worth £181,953 withdrawn from the company’s bank account, and what happened to £68,100 received as part payments for franchise. Neither was it possible for the investigation to determine the full extent of losses incurred by customers or who these customers were. Mark Bruce, a chief examiner at The Insolvency Service said: “Company directors must keep sufficient financial records that show and explain the company’s transactions. Coffery of Datadesk Computer Services, which operated as supplier of office and technology equipment, was also disqualified for seven years, at Airdrie Sheriff Court in Scotland. The investigation found that the lack of proper accounting records meant it was not possible to verify if £312,266 paid out of the bank account was for the benefit of the company. This included over £123,141 paid to a company which holds petroleum exploration and extraction rights in Sierra Leone, West Africa and £26,000 paid for the purchase of coffee and related products. In addition, there were unexplained cheque payments totalling £79,038. The company entered liquidation on 3 February 2012. It’s been announced today that from January 2014 the Insolvency Practitioners Association of Australia (IPAA) will be known as the Australian Restructuring, Insolvency & Turnaround Association (ARITA), and that from February 2014 the CEO of the association will be John Winter, former head of a professional association of accountants and a person with “an extensive background in media”. John Winter’s career and specialities are detailed on his LinkedIn page.